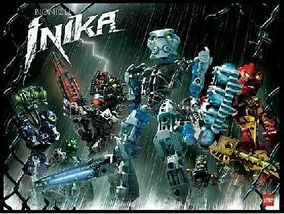 The Toa Inika were a group of Matoran from Metru Nui that were transformed into Toa by lightning that descended from the Red Star, on their way to Voya Nui. While traveling in Toa Canisters, the Red Star shot out a bolt of lightning, which caused the Matoran to become the way that they were. Their Toa Tools were originally in their Toa Canisters. The reason why their masks were organic is because of their origin. Inika literally means energy from a star. These Toa also had Zamor Launchers constructed by Velika, loaded with Zamor Spheres, filled with Energized Protodermis (Which was only used to counter-attack the effects of Antidermis). The Toa Inika's masks were organic, as well as alive. Their masks could communicate to them usually through pain, which is why Hahli had headaches whenever she was near the Ignika. This is also the reason why it did not take very long for the Inika to learn how to use their masks: their masks helped them discover the powers. In Inferno, the Inika went inside the Zone of Nightmares. As the name suggests, the Toa faced their worst fears, in every case, it was losing control of their newfound powers and killing a being. The "killed" beings then morphed into the Toa Nuva. Fortunately, the Toa discovered that these "Toa Nuva" were only illusions made to demoralize them and continued on their journey to the Ignika. Matoro eventually took the Ignika from Vezon's head, with some aid from Kongu. Once the mask was acquired, the Toa went back to the surface. Unfortunately, the mask was lost and floated down into the sea. Hahli made an attempt to retrieve the mask but started to drown, she was saved by a mysterious Matoran that died upon reaching the surface. The Toa Inika were then found by the Toa Nuva and Axonn. They had a brief discussion in which it was decided that the Inika would go after the Mask of Life, the Toa Nuva would leave, and Axonn would stay and protect the Matoran. After saying their goodbyes to the Nuva, Axonn led the way to the Stone Cord connecting Voya Nui to Mahri Nui. Axonn shattered the entrance and the Inika went in. They were attacked by Zyglak on the way down and had to flee into the water where they were transformed into the Toa Mahri by the energy wave sent by the Kanohi Ignika, thus transforming their physical state, masks, and weapons. The Toa Inika were impervious to Antidermis. The Lightning they were charged with counteracted the virus. The Toa Inika's Elemental Powers were all permanently entwined with Lightning, which means that they cannot separate their Elemental Power from the Lightning. For example, Jaller couldn't control Lightning or fire seperately. When the Inika masks were removed, a bright light shone from their heads, making their facial features indistinguishable. This page uses content from BIONICLEsector01. The original article was at Toa Inika. The list of authors can be seen in the page history. As with Brickipedia, the text of BIONICLEsector01 is available under the GNU Free Documentation License, however please help to make this a unique article to Brickipedia in any way you can. This page was last edited on 10 January 2016, at 00:51.